Early in October, peace negotiations will take place between the Colombian Government and the Revolutionary Armed Forces of Colombia (FARC) in Oslo, Norway. If successful, the talks will continue in Havana, Cuba. These talks are taking place against the backdrop of major military victories by the Colombian army against the FARC, the elimination of key FARC leaders in the last four years, and, confirmed connections between the FARC and the governments of Venezuela and Ecuador. The upcoming talks were made possible through the mediation of Chile, Venezuela and Cuba. Venezuela and Cuba are two key players in the revolutionary, anti-American Bolivarian alliance. The Government of Venezuela has been one of the staunchest enemies of Colombia whom it views as an American puppet. Venezuela has also objected to the war on drugs and to Plan Colombia.. Many of Hugo Chavez’s international political attacks have been directed towards Colombia. Chavez even started an arms race with the help of the Russians and made a number of threats against his Colombian neighbor. Chavez also made alliances with the FARC, proven in the FARC Files (or Reyes Files) captured during a military raid in Ecuador early in 2008. Venezuela served as haven for the FARC guerillas escaping Colombia and also made alliances with other drug cartels who are the archenemies of the Colombian government. The presence of Chile in the mediating group looks rather symbolic and poses a serious question mark as to their reasons for participating. On the other hand these talks are taking place in Norway, far away from the region and in a country whose dominant political culture has been apologetic towards extremist organizations. According to Alan Dershowitz, a well-known Harvard Law professor, the former Norwegian Prime Minister, Kare Willock reacted negatively to President Obama’s selection of Rahm Emanuel as his chief of staff. It appeared that the fact that Emanuel was Jewish disqualified him for a job that included dealing with the Middle East conflict. Following the same logic, the Government of Norway has also maintained contacts with the arch-terrorist group, Hamas, claiming that it supports “dialogue”. In other words, whether Norway’s opinion matters in the FARC-Colombia dialogue or not, Norway’s role is consistent with its approach that “terrorist groups might not be that bad, after all. It is likely that Norway’s sponsorship will lend legitimacy to the talks. It is also likely that they will bestow the status of “freedom fighter” upon the Colombian guerrilla group even though the FARC is and has been responsible for the deaths of countless innocent people just like Hamas. As stated, if the first round of talks are successful the second round will take place in Cuba, a country that has supported both terror and the FARC. 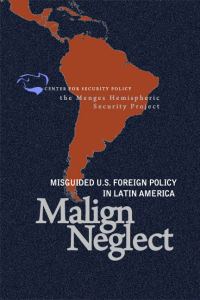 Though it is not clear why Santos agreed to these negotiations given that terrorist organizations like the FARC are not known for their trust- worthiness in abiding by treaties, there are a number of possibilities as to why these negotiations are taking place and the kinds of outcomes that may result. First, it is possible that the Colombian government believes it can reach a good deal given the weakness of the FARC after four years of military setbacks. In this case, the FARC can either become a political party or somehow be integrated into the democratic mix. . Such expectation is based on the belief that the FARC may replicate the experience of the M-19, a former guerilla group, which so far has been positive and lasting. Thus, if the FARC follows in the footsteps of the M-19, Colombia could have a situation of total peace. The Colombian people would then be happy and grateful to President Manuel Santos for his efforts. However,I find this scenario to be highly unlikely given the still extremist discourse, behavior and resentment of the FARC leadership. In order to find a possible answer to the reason for these strange negotiations, mediated by two allies of the FARC and enemies of Colombia, it is important to understand some of the shifts that the FARC has undergone in the last several years. The alliances between the FARC and the Bolivarian countries have a deep strategic meaning. The FARC is a guerilla movement with decades of experience in what is called “asymmetric war” or the war of the weak against the strong. “Asymmetric war” is a concept adopted by Chavez very early in his tenure. He defines it as the “war of all the people” against a never to come U.S. invasion. Though defined this way by Chavez, asymmetric war can be fought in support of the consolidation of a revolution and the spread of terror on an oppressed population or as a subversive force against a government the revolution seeks to overthrow. The FARC’s weakening has forced the organization to cut an alliance with Hugo Chavez and the Bolivarian Revolution. In light of this, the Bolivarian Revolution seems to be the only viable way to achieve a radical transformation. Thus, the FARC has loosened its ideology of peasant-based Marxist revolution in order to embrace the Bolivarian Revolution and to commit to its expansion. This includes the fight against U.S. imperialism, neo-liberalism and globalization. Likewise, it embraces socialism and continental unity. The Venezuelan Bolivarian leader, Hugo Chávez created a body called the Coordinadora Continental Bolivariana (Bolivarian Continental Coordinator or CCB), which later changed its name to Bolivarian Continental Movement (MCB). The CCB and the MCB has the FARC as one of its members. Although, in the same message the FARC stresses the need to continue the armed struggle against imperialism and particularly against Colombia, it is clear that they no longer have the ability to act without the help of the Bolivarian Revolution. In short, the FARC has ceased to be a solely Colombian organization but rather has become part of the Bolivarian Revolution. Its activities and involvement are now regional and transnational. Indeed, the FARC is involved in about thirty countries to varying degrees. Some of their operations are more visible and some more clandestine. The FARC reaches out to students and regular militants with propaganda and ideology and sometimes helps insurgent militias. Sometimes, they are involved in drug trafficking and sometimes in money-laundering. Sometimes they have sought support for their organization and sometimes they have sought to secure sanctuary. In Mexico, the FARC has worked with the Ricardo Flores Magon Militia and has provided financial support to left-wing politicians. In Peru, the FARC has reached out to the Peruvian Revolutionary Movement, Tupac Amaru (MRTA). The FARC provided training to several groups including a splinter group of the MRTA and the Left Revolutionary Movement (MIR). The FARC also recruited people in Peru and provided weapons to the Maoist guerilla group, Sendero Luminoso (Shining Path). In El Salvador,the FARC used its connections with the Frente Farabundo Marti (FMLN), now in power, to purchase arms and munitions. In Bolivia,the FARC tried to carry out activities of indoctrination. In summary, the reason why the FARC wants these negotiations is to give them legitimacy in the eyes of the world under the auspices of an incredibly naïve Western country like Norway that sees nor hears no evil. Since Norway’s attitude towards Hamas is exculpatory, it is likely that this country will turn the blame on the Colombian government while providing excuses and apologies for the FARC. Regardless of how insignificant Norway is as a world player, it could distort the Western European perception of reality in South America in the same way it has done in the Middle East. In addition, the FARC could get “a break” from the Colombian mighty and effective hunting machine. In that way, the FARC could then concentrate on their Bolivarian revolutionary goals. Most recently, Hugo Chavez stated that if he does not win the October 7th election there would be civil war. For that he needs a robust and healthy FARC. Therefore, the strategy is aimed at placing the Colombian government, which is the most effective tool against the FARC, on hold. But paraphrasing Chavez,“por ahora” (for now). President Santos has proven to be a wise man. We hope he has taken all these elements described above into account. But Santos also needs the help of the U.S. government to make the right choices. Santos has refused to agree to a ceasefire until the negotiations are under way. Likewise, he pointed out that these negotiations will not be allowed to drag on forever. Santos has said that he will give negotiations a chance for no more than six to eight months. This is good. However, as pointed out, even if there is an accord, the dangers of the FARC are not likely to go away as long as Chavez keeps them busy and provides them with a life-line. Colombia is the most important U.S. strategic ally in the region and should not fall into a trap. Colombia is the country that keeps U.S. enemies in the region at bay and is an important regional ally. It is not certain whether we have recognized the fact that the Bolivarian Alliance and their allies aspire to weaken and eventually defeat their American neighbor to the North. 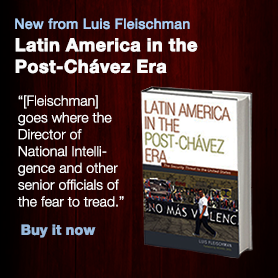 In the meantime Chavez and his allies will do anything in their power to chip away at U. S. interests. The United States needs to open its eyes to this reality and act accordingly. “Aporrea, Conclusiones del II Congreso de la Coordinadora Continental Bolivariana (29 February 2008), http://www.aporrea.org/tiburon/n109960.html. “Saludo de las FARC-EP, Marzo de 2012” http://www.youtube.com/watch?feature=player_embedded&v=g9Gbk_RCopM#! The World of the FARC (Part II: America),” Semana, January 6, 2009. Hanna Stone, “Paraguay’s EPP: Phantom or Rebel Army?,” 2 May 2011, http://insightcrime.org/insight-latest-news/item/852-paraguays-epp-phantom-or-rebel-army. [i] ‘Fluidos Contactos con las FARC antes del Secuestro de Cecilia Cubas”, ABC Color, Asunción, September 15, 2009.